Rotterdam is not a city that can be easily digested by the tourist in search of windmills and the emblematic stepped gable houses characteristic of the Dutch Golden Age. Rotterdam is the odd one out in the Netherlands – the city that doesn’t fit into the stereotypes, the city that chose its own destiny. Is it worth visiting Rotterdam? What can you expect from Rotterdam? You will either like it or not. It shouldn’t also need to be love from first sight. Personally, it took me a few visits to the city to be able to see through it, to understand it, to enjoy it. For me the turning point was when I joined a few tours to discover a lesser known Rotterdam beyond the obvious and already touristy, to hear about what shaped the city through the years. I already knew that Rotterdam’s city centre was levelled with the ground during World War II, but it was a real eye-opener to be confronted with images of Rotterdam after the bombardment, standing at a place which once was nothing more than a pile of rubble and being surrounded today by high-rises and quirky modern buildings. The city chose not to look back but embrace a future where only the sky is the limit. Rotterdam recovered from the destruction without being sentimental and with a great dose of pragmatism. A melting pot of cultures and nationalities, a mecca for street artists and hipsters, Rotterdam is anything but boring and conventional. It is unexpected, and it surprises. It attracts, and it challenges. Rotterdam is like no other Dutch city – it’s vibrant, it’s modern, it’s fascinating! Rotterdam is such a different city than other cities in the Netherlands. As Rotterdam was destroyed during World War II, the city was rebuilt with a dramatically different skyline, which truly makes it stand out among Dutch cities. Architecture lovers will be in heaven although for me, Rotterdam shines the most with its happening hot spots, great food, cool bars/cafes, and innovation hubs. I love old Dutch architecture, so Rotterdam isn’t my city of choice to live in although I enjoy taking a day trip. (The Markthal is always great to visit!) At minimum, come and experience Rotterdam to experience both the old and new sides of the Netherlands! Follow Karen on Instagram. Read about her favorite places in Rotterdam here. My Favorite area in Rotterdam is Witte de Withestraat with its myriad of eateries, alternative boutique stores, art galleries, cafes, and street art. Though one might call this area as overrun by hipster-artsy types (who’s to argue the trendiness of man buns, flannel, skinny jeans, avocado toast, and independent coffee roasters). I believe this street is a microcosm of Rotterdam in itself. The contemporary art museum in the middle of it all has quirky exhibits that make one think about modern life and self. On a rainy day in the fall, I stumbled upon the Witte de With Centre for Contemporary Art museum and was instructed to return in the evening for the gallery opening. When I returned that evening, the whole building was transformed into one big party with DJs, free flow drinks, performance art, and a gallery opening for the new exhibits there. Contemporary art is not for everyone as it can be outrageous, absurd, quirky, and provocative. These are precisely the things that draw me into contemporary art as it makes me think about the art piece, the artist’s intention, life, the world, and politics. I think my favourite discovery of my trip was something the people in Rotterdam refer to as the ‘Kabouter Buttplug’. Literally translating to the ‘Buttplug Gnome’, this giant statue is aptly named. If you want to see a giant gnome holding what looks like a giant buttplug then head to the Eendrachtsplein, a shopping street next to Museum Park (also a beautiful space to visit). It was originally intended to be Santa holding a Christmas tree, however, the artist had other ideas and it was rounded somewhat; thus the Buttplug Gnome was born. I urge you to go and see it. I promise you, if you have the slightest amount of immaturity left in you, it will make your day. We have mixed feelings about Rotterdam. At first, we were pretty impressed with its modern and quirky architecture, especially when we saw the cube houses. We also liked the harbourside and the industrial bridges. However, we found it quite difficult to find good food for our dietary requirements. We only found one good vegan restaurant with nice food and good service. As interesting as the city looked, we couldn’t connect with it. I would say certain parts were great for street photography, but not a dream for landscape photographers, that’s for sure. Would I recommend Rotterdam for first time visitors? Of course, I think it’s an interesting city with a great vibe which should be experienced. But we wouldn’t rush back anytime soon, nor would add it to our upcoming Netherlands itinerary. Rotterdam probably wouldn’t have made the list if we hadn’t been going to Traverse18. Thankfully we went otherwise we would have missed out on this gem of a city. We fell for Rotterdam hook, line and sinker. The locals were quick to tell us not to be fooled by the glorious, hot and sticky weather – which of course we were (although we could have done without the mosquitoes!). With tree lined avenues, striking architecture, street art peeking out unexpectedly, easy to use public transport and diverse food cultures it is hard to pick our favourite place. Walking the streets discovering interesting architecture and street art was a memorable experience, made better by stopping and having a beer or coffee on the way. Now we are asking ourselves, when are we going back? I like cities that are cozy, historic, and as the Dutch say, ‘gezellig’ (which means cozy, relaxed and pleasant all at once). Rotterdam misses the mark on these points, and yet, manages to captivate. It’s open, airy, international, and presents you with a wonderful mix of modern and traditional. My favorite spots of the city are where the new mixes with the old without overpowering it, such as this view on the Laurenskerk which combines a restored Gothic church and a colorful graffiti all in one go. To appreciate this view head over to the corner of 3e Westewagenhof and Westewagenstraat. The city’s spacious territory is like a clean slate begging for a new history to be written on it. And clearly its residents don’t need to be asked twice. Exploring the city of Rotterdam really opened my eyes to secret locations and new experiences within Rotterdam, a place I call home for 7 years now. What I loved the most was taking a walking tour to view and find new street art murals on streets I’d never heard of. From experience, some cities are full of graffiti that isn’t very nice, just tags or text that is no longer readable. However Rotterdam has an amazing group of street artists that bring the city to life with more than just text by their passion with street art designs. Rotterdam is also less touristic than Amsterdam, allowing you to really immerse yourself in the culture and mix with the locals better. I love living here and can’t wait to explore more of the urban local locations I’ve discovered! My advice for those visiting Rotterdam is to look further than the city centre, to cross the River Maas and explore the so-called Southern Rotterdam (Rotterdam-Zuid). You can start with Katendracht and the Fenix Food Factory – a thriving indoor fresh market where you can do your weekly groceries and have some fantastic international food, or get to try one of the 30 beers offered by the Kaapse Browers. Should you visit Rotterdam? Give it a try! It is the different Dutch experience. 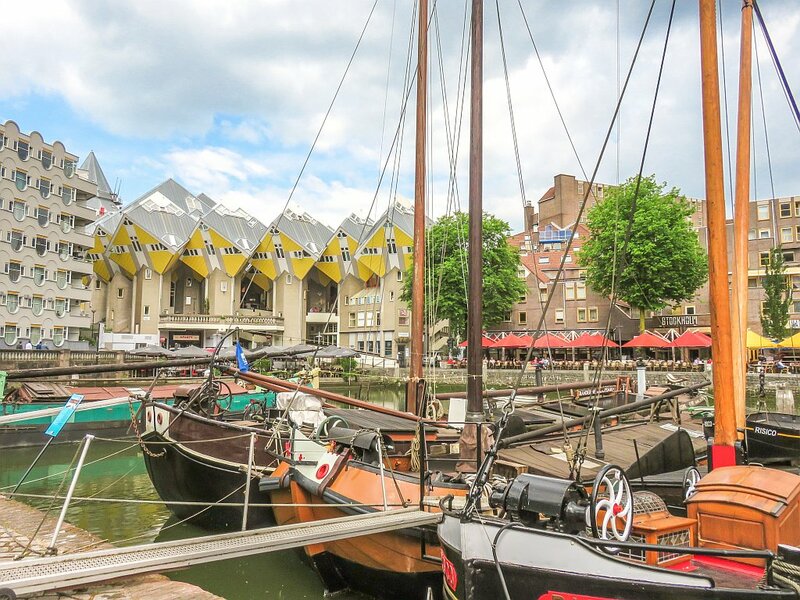 Your visit to the Netherlands won’t be complete without a visit to Rotterdam. Let me know how you felt about Rotterdam! Was it a love from first sight? Or it wasn’t just your cup of tea. I’ve visited the Netherlands multiple times, but still haven’t gotten to Rotterdam. Thanks for sharing the honest feedback on the city. I definitely want to visit on my next trip to the Netherlands, but realize it may not be the “typical” Dutch experience. Still, I look forward to the visit. Thank you! Before I read this post I hadn’t really thought of Rotterdam from a holiday perspective, to me it was more of a business travel city. But I was wrong, and now I am definitely interested in finding out more about this city! Thank you for sharing. And is the buttplug gnome was a hilarious touch lol.